To be a successful interior designer, it's essential to market yourself and your firm effectively. 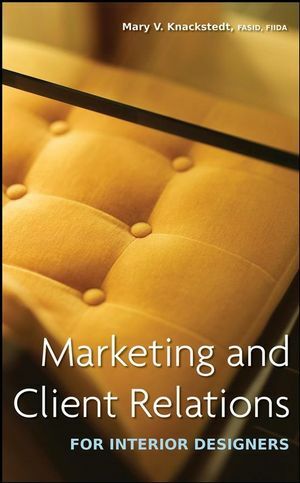 A must-read for interior designers establishing a client base, as well as for seasoned interior designers aiming to grow their businesses, Marketing and Client Relations for Interior Designers offers valuable tips on enhancing client relations and building lasting relationships for a growing practice. This step-by-step manual helps you design the marketing program that best fits your unique practice and provides helpful business forms to help keep you on target, including staff questionnaires, planning guides, and design services outlines. Brimming with examples and proven strategies from successful, highly profitable firms that make it easy to apply the book's marketing techniques to your own business, Marketing and Client Relations for Interior Designers is your design firm's guide for business development, successfully marketing its services and maintaining long-term customer relationships. Mary V. Knackstedt, FASID, FIIDA, is president and founder of Knackstedt, Inc., of Harrisburg, Pennsylvania, and New York. She is an interior designer, furnituredesigner, consultant, and lecturer, and has taught interior design business practices at Harvard's Graduate School of Design for more than ten years. Knackstedt heads the Designers' Business Forum, a program dedicated to raising the level of interior design firms.